Specialities At Relentless Hair by Nicky Birch I am passionate about providing exceptional hairdressing services that make my clients look and feel fantastic! If you're in the area of Brunswick or Melbourne's Northern Suburbs, why not pop into my hair salon for a day of pampering from an expert hairdresser? I stay up to date with the latest trends, technologies and treatments to provide you with stunning hair styles! Vibrant Hair Colours Looking to add some colour to your life? I offer stunning hair colouring services to put life back into dull, lifeless hair. Whether you want blonde hair colours, brown hair colours or aren't sure about what hair dye will best suit you, just talk to me! I will provide gorgeous hair colour ideas to suit your wants and complexion. I also offer organic hair colours, chemical free hair colours and scalp bleaching. Natural Hair Extensions There's nothing worse than hair extensions that just don't fit. At Relentless Hair by Nicky Birch I offer natural hair extensions that will fit seamlessly into your hair, adding volume, length and new life to your hair! I also offer spectacular tape hair extensions that I know you will love! Dazzling Wedding Hair I understand how difficult it can be to find a wedding hairdresser that you can trust with your hair on your special day, but there's no need to worry. As a highly experienced hair stylist, I will strive to give you the perfect hair you envisioned for when you make your journey down the aisle. History I pride myself on being a highly trained and experienced hairdresser, with a passion for creating spectacular hair! My clients throughout Brunswick and Melbourne's Northern Suburbs are my number one priority. I am dedicated to finding the perfect solution that perfectly suits my clients' wants and needs at an affordable price. Never again will you have to choose between exceptional hair and affordability, because at Relentless Hair by Nicky Birch I offer both! Hairdressing | Body Piercing Individual - We love connecting with our clients and treating them as the unique individuals they are! We want to create for you an individual look that suits your hair type, face shape, image and lifestyle, giving you the confidence to express yourself as you truly are. Alternative - We want to offer you an alternative. An alternative in the look you want: we're different; we listen; we're down-to-earth; we're creative; we discuss your options. An alternative which is socially and environmentally responsible with the products used: even our coffee is fair-trade! Natural - Great hair shouldn't cost the earth. We use high quality products, such as DeLorenzo, which are naturally based, eco-friendly, gentle on the hair and scalp, don't contain animal products and are definitely not tested on animals! 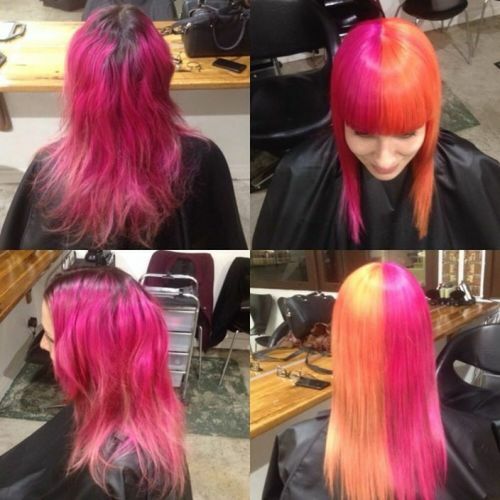 Hoopla Salon is an eco-friendly & animal cruelty free hairdresser. We use De Lorenzo hair care products, which are not tested on animals and contain no animal bi-products. But on top of that, we offer the highest level of hairdressing, professional advice and outstanding service. The team at Hoopla are continually perfecting their skills through ongoing training and keeping ahead of the trends, this ensures our clients an amazing experience and an individual look that can be easily styled after you leave the salon. Luscious Locks and Lashes offers the highest quality Remy Tape and MicroRing Hair Extensions, Synthetic and Silk Eyelash Extensions and Spray Tans at an extremely affordable price. Luscious Locks and Lashes uses the MicroRing and Tape hair extensions systems, which are the safest and healthiest methods of hair extensions as they are easily installed, maintained, washed, styled and removed. And they don't damage your hair ! Perfect for weddings, formals or just everyday! The hair used is 100% highest quality human Remy hair. Luscious Locks and Lashes Hair and Eyelash Extensions add volume and length to your hair and lashes! We have over 20 different hair colours available so your new hair extensions can easily be matched to your existing hair colour and tones. Luscious Locks and Lashes offers a mobile service for Melbourne Metro or come to our Brunswick Boutique. You will be thrilled with the result of your new Hair and Eyelash Extensions! Contact Bec for your appointment or price list today!